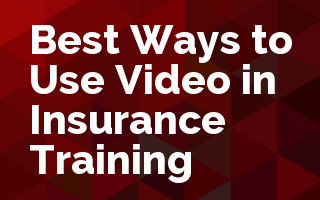 We've all heard that video is the way to go in training. The problem is how do you do it? Do you produce your own? Does that mean that you have to buy expensive equipment? What about YouTube, or Vimeo? Can I use them? There are many different methods of creating and consuming learning. People go to classrooms. We host webinars. One very popular way of creating learning today is the use of video. The problem is that we don't always know the best way to do that. We wonder if we need to invest in expensive equipment, or can we use our smartphones to shoot it. We wonder if we need to create the video, or do we have to buy it. Maybe we can use YouTube, or some other on demand streaming service. What's the best way to use video in a classroom or in other learning venues. Richard started his insurance career in 1980 with Royal Globe Insurance. After 5-years with Royal, Richard spent the next 25 years working for Hartford Financial Services Group. During his time with both of these companies, his assignments included the roles of Underwriter, Underwriting Supervisor, Major Risk Account Executive, Underwriting Manager, Commercial Business Unit Manager, Quality Training & Sales Manager and Director of IT Training & Communications. In January 2010, Richard retired from The Hartford and began his “retirement career” as Director of Sales Training for Georgia Farm Bureau (GFB). In this role, he gets to work directly with agents and agencies all over the state developing and delivering training for P&C products, selling skills, new hires, management & leadership. Richard holds ITP, CPCU, CIC, CRM, ARM, AAI, AFIS, ARe, AIC, CPIA, AINS, AIT, SPPA, CPPA and ITIL v2 designations and certifications and is a lifelong learner and student of the insurance business. Scott is a video producer, director, actor and an accidental instructional designer. As a producer, he has created content to teach young athletes about nutrition, in addition to training videos to reach audiences for brands like Adidas and Gatorade. He currently leads the development and execution of multimedia solutions at Roundtable Learning. He uses video to reach learning initiatives ranging from on/off-boarding, soft skills, and technical training to live conferences and immersive 360 VR video. He enjoys using the storytelling and visual capabilities that video and motion graphics offer to increase the consumption and retention of learning and development training. Larry is the Training Leader for American Integrity Insurance Company where he is responsible for creating and leading the training team and strategy throughout the organization. He has worked in the insurance industry for over 14 years primarily in the Florida marketplace. Larry also leads all digital and online learning programs and strategic video techniques are at the core of these programs. He holds a Bachelors in Business and Finance, an MBA and MS degree in Risk Management in Insurance from Florida State University and is an active CPCU candidate. Arthur Carvajal, Executive Editor & General Counsel, WebCE, Inc.
Arthur is general counsel for WebCE, Inc., a subsidiary of International Risk Management Institute (IRMI). He joined the company in 2009 after 12 years with Kaplan Financial Services, where he developed courses for insurance prelicensing education. At WebCE, Arthur is also responsible for insurance prelicensing content and monitors state regulatory and legislative activity affecting the insurance industry. He is a graduate of the University of Notre Dame Law School and practiced civil litigation representing insurance companies before entering the insurance training industry.